Donald Trump Jr. has repeatedly made it clear he has no regard for wildlife. One quick Google image search will reveal that the president’s eldest son has a penchant for trophy hunting animals like leopards and elephants abroad. Now he’s brought this despicable hobby back home: Donald Trump Jr. just posted a photo of himself proudly posing with a worm he shot on the White House lawn. This is revolting. How could someone take such pride in depriving a beautiful animal of its life? Donald Jr. took to Instagram today with a photo of himself decked out in camouflage and kneeling beside the remains of a worm he’d slain from behind a Rose Garden bush with a .458 Winchester rifle. 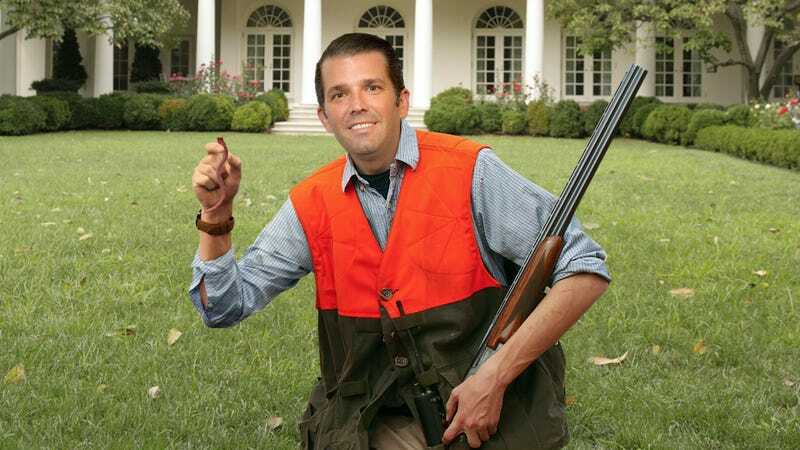 With one hand on the gun and the other holding up the mangled remains of the worm’s body to display his “trophy,” Don Jr.’s boastful display of wanton cruelty is sure to set off a wave of righteous outrage from conservationists and animal lovers across the country. Big “man” you are, Don Jr., killing a defenseless worm. Shame on you. To see an animal die for this man’s vanity is so upsetting we want to cry. As the son of a president notoriously hostile to conservation efforts, Don Jr. and the whole first family continue to represent a dire threat to wildlife everywhere. Just awful.